I am getting so tired of this cold winter weather so what better way to warm up than by working on a bright springy layout! The new Cottage Cutz Butterflies from the Valentines Release are going to be must haves for all of your spring projects this year! This die is sooooooooooo cute and the butterflies are so easy and quick to put together! I love how I can customize the butterflies with the exact colors I want and the direction I need it to face! This layout was inspired from PageMaps because as you know I love to play with sketches! So get out your Spring papers and get to scrapping! I am sad to see February end. I have had so much fun working with these adorable CottageCutz Valentine dies! 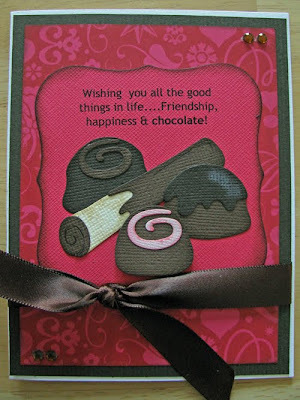 Of course, they are perfect for Valentine layouts or crafts but are adaptable enough to be used year round. Both of the dies I am showcasing today are so versatile. These are the dies you will keep pulling out to use on your pages. They really add that extra something to your layout or project. The CottageCutz Heart Doily can be cut in so many different ways to create so many different looks. I have used it here, only cutting the top, to create the scallops of lace. You could also only cut the bottom V of the heart, for a different lace effect. The CottageCutz Lock and Key is a perfect embellishment to use on so many of your creations. Use them together or separately. Ideas for this die include, in titles(see Watch for it Wednesday #48) or cut only the heart die to use as an accent(see layout below) and finally the keys, a great die to have for a variety of different projects(see layout below). Welcome to Watch for it Wednesday! For today's project you will need a bottle or two of Glimmer Mist and your favorite die. I used the ribbon in the Cottage Cutz Lock and Key die. 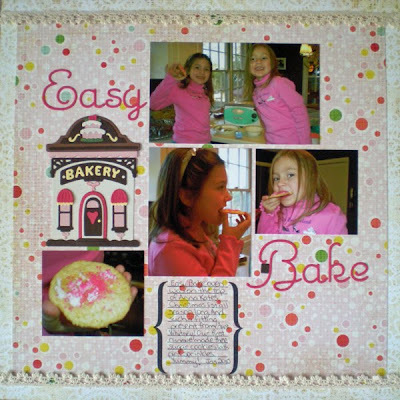 You will also need a craft mat but if you don't have one you can use a piece of wax paper. Spray some of the Glimmer Mist on the mat or wax paper. Take your die and rub it face down in the Glimmer Mist you sprayed on your mat or wax paper. Once you completely cover the die with Glimmer Mist, pat off the access with a paper towel. Let it dry and you are ready to use it on your layout or add another color of Glimmer Mist. This chipboard heart was sprayed with two colors of Glimmer Mist. Doesn't the heart look great? You can also use Glimmer Mist to add color to your paper. This paper was sprayed with Pumpkin Pie Glimmer Mist. Once it was dry I added a little green ink. Happy Monday!!! Ice Cream Sundaes are fun to eat all year around. You could probably have a different sundae everyday. They are great with hot fudge, pineapple or strawberry toppings. The Cottage Cutz Ice Cream Sundae on this composition notebook is a little different, an Ice Cream Sundae with Strawberry toppings and a little chocolate on the top. Dare to be different when you use your ice cream die and make it with your favorite toppings. This is a fun project and easy to do. Just get a composition notebook and some scrapbook paper and your favorite Cottage Cutz dies. I used Mod Podge to adhere the paper to the notebook. Let it dry and then add your favorite Cottage Cutz dies and embellishments. 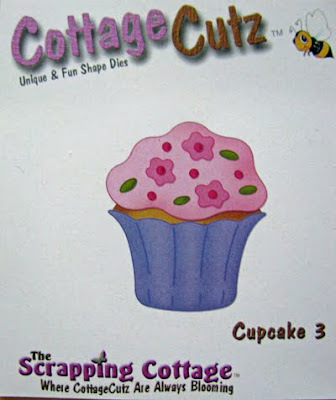 I just love all of the Cupcake shapes from the Valentines Cottage Cutz release! They are each so unique and so different that it is hard not to want them all, but I think everyone needs at least one of these in your stash! Cupcakes can be used for any and all holiday and other celebration themes which is why these cupcakes are so versatile. 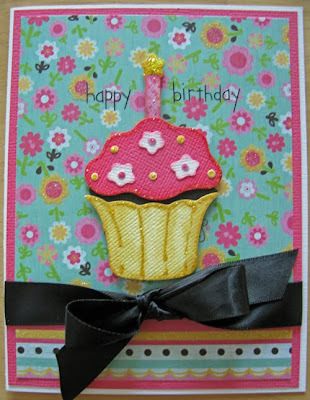 I created this card by pairing this cute Cupcake #1 Shape with some Basic Grey papers. Aren't these papers perfect with the Cottage Cutz cupcakes?! Any of the cupcake shapes would really be a fabulous embellishment with these papers! I loved how great the stickles looked on one of the adorable tags posted on the Scrapping Cottage Facebook Page and so I wanted to try it on my cupcake, too. I used a contrasting color of stickles to coordinate with the cupcakes from the papers. I am having so much fun creating layouts and other projects using the yummy new shapes from the Cottage Cutz Valentines Release. There are so many possibilities my fingers just can't keep up with my "to-do" list! One of my oldest daughter's favorite Christmas presents this year was her Easy Bake oven. I think this gift is a right of passage for all little girls. I can still remember my own Easy Bake Oven. So of course I had to take some pictures of our maiden voyage of the new Easy Bake oven. Big sister was not thrilled with little sister helping, but if there is one thing she loves most, it's sweets. So little sis couldn't wait to play Easy Bake Oven, too!! As soon as I saw the Bakery Shoppe from the Valentines Release, I knew it would be the perfect addition to an Easy Bake Oven layout! This shape pieces together very easily. I recommend starting from the bottom of the Bakery and working your way up to the top to make sure you end up with enough space for everything. It can easily be customized for any layout by changing the colors in the cute awnings and trims. I chose to pull out colors from my girls' pink shirts, a darker pink from the polka dot paper and a touch of yellow from the paper and the cookie. Thanks for stopping by the Cottage Blog! If you haven't joined our Facebook group yet, click the image on the right of the blog and become a fan! TGIF!! This is the CottageCutz die I will be showcasing today. Any way you use it, the CottageCutz Strawberries w/ Chocolate die is a sweet treat! This versatile die can be used all year. For my layout, I only cut the strawberries not the chocolate. This gave the strawberries a fresh spring look perfect for my page. I used bright colors to keep with my spring/summer theme. A simple layout that keeps the focus on my photos and the cute CottageCutz Strawberries. I hope you all get some creative time today! I wanted to talk today about sewing on layouts. I thought I would go over some of the basics of stitching on scrapbook pages. It is a great way to add texture and dimension to your pages. It also adds a bit of whimsy and fun. First, these are the CottageCutz dies I am showcasing today. I recommend that you practice on some scrap paper first. You are going to need to adjust the stitch tension and stitch length depending on your machine. I find for me, that a medium stitch tension works best and a long stitch length. The other thing to remember is the speed at which you sew. If you sew slowly, you will run the risk of the stitches not catching. If you sew too fast, the thread seems to get clumped up in knots on the backside. 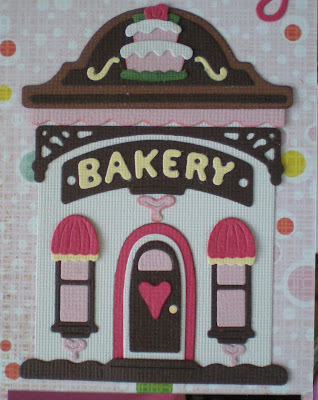 As far as what type of paper to use, I have sewn on cardstock, pattern paper and die cuts. They all work fine. You also don't need any fancy kind of thread, just regular sewing thread. Now that we have gone over some of the basics, on to the fun stuff. What can you do with the sewing on your pages? Tip #1-A great idea is to stitch around your photo or entire layout to frame it. I used both a straight stitch and zig-zag stitch around my photo, this adds interest and playfulness. 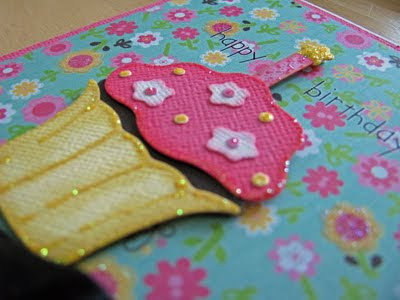 Tip #2-Stitching is a great way to adhere paper or items to your pages. I used a straight stitch to attach my CottageCutz Heart Doilies to my page. This gives the Doilies dimension because they lift on the sides. This is another example of using sewing to adhere items. I used zig-zag stitches to attach my journaling strips to my page. Tip #3-You can create accents with sewing. I stitched a heart using both a straight and zig-zag stitch to frame my CottageCutz Key. I hope this will inspire you to try sewing on your layouts. You've heard the saying "What do you do all day, eat bon bons on the couch and watch TV all day?" Well, I had fun making diecut bon bons on my stool in my craft room all afternoon. Too bad I didn't have some real ones to eat while I was making them. 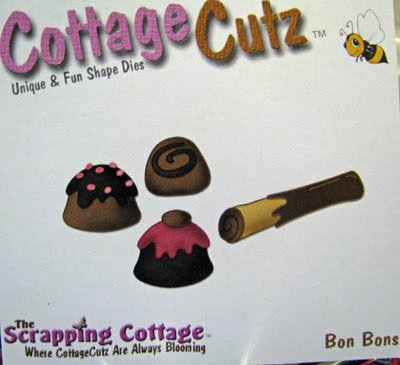 This CottageCutz Bon Bons die lets you create your own box of chocolates. I cut out my bon bons in "milk" chocolate and "dark" chocolate and then sponged around the edges with some distress ink. This release is so much more than just Valentine's Day, there are so many fun "sweets" to make all year round. I hope everyone is having a lovely Valentines Day!! Today is not only Valentines Day, it is also my parents' 40th Wedding Anniversary. So I decided to whip up a card to take to them at dinner tonight. 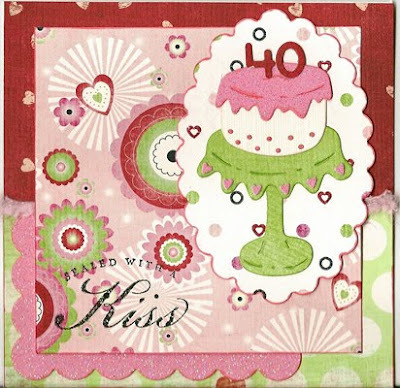 The new Cottage Cutz Cake on a Pedestal shape is the perfect addition to a celebratory card like this one! Yep, that's right! I have finally made it back home from the happiest place on earth. Disney World has to be one of my favorite places in the whole world. I have just as much fun now as an adult as I did when I was a child. You never get too old to enjoy the magic of Disney! However, the older you get, the longer it takes you to "recover" from all that fun!! Honestly, I can truly say I have never been this tired in my whole life. I was even too tired to scrapbook! Fortunately, I have rallied a bit today and was able to finish up my Blog project that I started before I left. Since Valentines Day is fast approaching, I thought a Valentines card would be appropriate for my post this week (one day late - sorry about that!!!). There are so many darling new Cottage Cutz Valentines Dies to choose from when it comes to making your Valentines cards and layouts this month that it is hard to decide which one to use first! Be sure to check out the newest Cottage Cutz Easter/Spring Release!! There are some absolutely adorable new shapes for Easter and St. Patrick's Day as well as great Spring embellishments to go along with all of your upcoming projects. Definitely some "must-haves" in this newest release to be sure!! Happy Thursday Everyone! With Valentines only a few days away, I wanted to share a quick and easy idea for a Valentine Treat Basket. See end of post for info on template. These are the CottageCutz dies that I am showcasing today. I used the CottageCutz Valentine Puppy on one side and cut a few more of his hearts as accents. I used the arrow from the CottageCutz mini(bow&arrow) to accent my punched heart. This Valentine Treat Basket is a perfect way to showcase those adorable CottageCutz Valentine dies. Embellish your basket with your favorite dies and fill with goodies. Remember this would work great with the new CottageCutz Easter dies too. I found the template for this cute basket online. It was very small, printed out on half a 8.5x11 sheet of paper. I scanned it back in and re sized it to print on a 12x12 sheet of paper. It is now a good size to fill with Valentine treats. If you are interested in the template, please email me at karenhelmka@aol.com. If you have a large format printer, print it on a 12x12 sheet of paper. If you have a standard printer, print it in halves, cut out and tape together and you are ready to go. Today I would like to give you a tip I discovered last week while working on my Gingerbread House shape. Since my "so-called" scrappy friends have gotten me hooked into these Copic markers (like I need another scrapping addition!!) I have started using them more and more in my die-cutting. Before when I wanted to add more layers and colors to my die cuts, I cut the shapes out over and over in different shades of paper. Now, I just cut out the shape once in white, and then color in the smaller detailed pieces in whatever colors I need. I encourage you the next time you are working with one of your Cottage Cutz Shapes that come as 2 or even 3 plates, try this method and see if you like it as much as I do! Come back tomorrow for our fabulous Guest Designer, Karen's Thursday post! About a year ago I bought this CottageCutz Dog because he was so cute and made this card. I loved how it turned out so I emailed it to The Scrapping Cottage and told them how much I liked this die. Little did I know at the time that I would have the privilege of working with these dies on the CottageBlog. So here we are a year later and there is another super cute dog diecut. 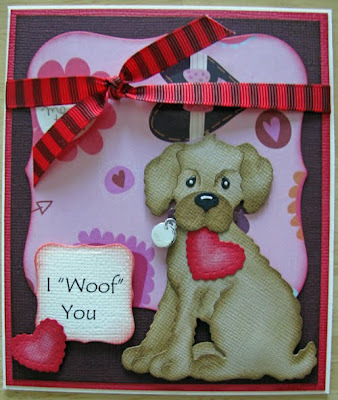 This CottageCutz Valentine Puppy is so dang cute and versatile. He comes with this heart so you can use it for your Valentine projects or you can use it without the heart for everyday projects. This puppy looks so real to me it makes me want to pet it! So whichever dog you like best you'll know you can't go wrong becaues they're both so cute - heck if you can't decide which one to get - get both! Good Morning Everyone! I am so excited to be making my first post. I am honored to have been chosen to be the February Guest Designer. The Valentine dies I got to work with couldn't have been any cuter! The CottageCutz Heart Doily is such a beautiful and versatile die. The minute I saw it on the site, I knew I wanted to cut it up to make lace. That is just what I did to frame the large circle. I cut thin strips of sugar coated cardstock and placed the strips over the top part of the Heart Doily to be cut, this created scallops. I then tucked them behind the circle for the lace effect. So pretty! I also used a complete Heart Doily to frame the CottageCutz Valentine Puppy. 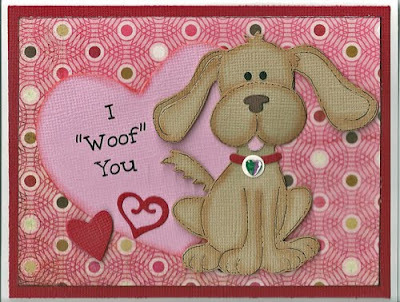 The CottageCutz Valentine Puppy is adorable! I wanted him to stand out on my layout, so I cut him first in chipboard and then the cardstock. I glued them together to give him some dimension. I used darker colors for my Valentine Puppy to contrast against the mostly pastel colors of the papers. I cut the heart that the Valentine Puppy holds in his mouth from a bright sugar coated cardstock, as I did two more hearts for accents. The title is also cut from the same bright sugar coated cardstock and pop-dotted. This ensures that the title and accents are not lost on my page. 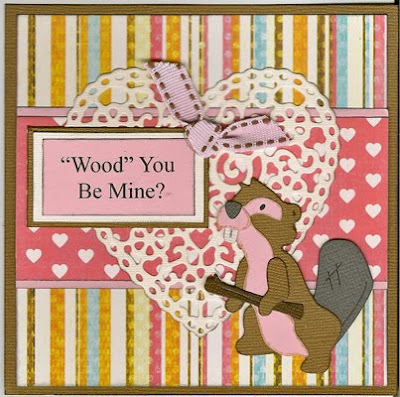 The New CottageCutz Valentine dies are so versatile, you can use them not only on your Valentine creations but all year long. So get creative and get scrapping! Hey Blog Readers!! We now have a new page on Facebook! Be sure to check it out and become a fan. You never know when we might post something special on Facebook. And you know you wouldn't want to miss anything like that! Plus, now you can start posting your own Cottage Cutz projects onto our Facebook page! We have some very talented followers and it is time for everyone to enjoy your creativity!! Let's fill up the fan photos album! I can't wait to see what you've come up with using our Cottage Cutz dies. As soon as I saw this Limited Edition Gingerbread House Die, I knew I had to have it! I mean, who can't use a Gingerbread House die, right?! Every year, my girls and I make a Gingerbread house together. When they were younger, it was hard to keep the decorations from disappearing into their little tummies. But this year, they were really into the decorating and actually worked on it together as a team without wanting to eat all the little candies. Well sort of ;). In order to jump start my layout, I used a Pagemaps sketch. I had taken so many pictures during the decorating process that I needed something to help focus me onto the best ones for a layout. This sketch worked perfectly for me. 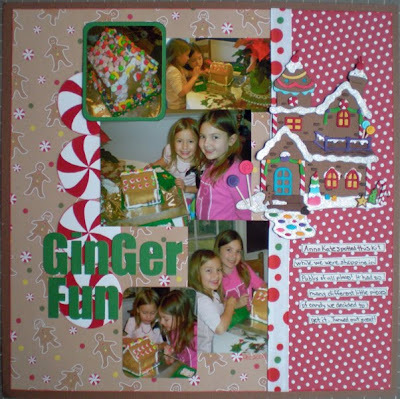 I love all the wonderful detailing on this Gingerbread House die. I just ran it through my die-cutting machine with brown cardstock and then again with white cardstock. 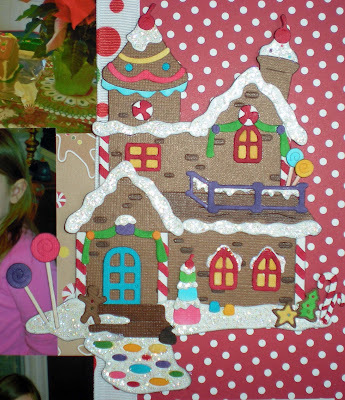 I built the house with the brown pieces and then used my Copic markers to color each of the candies and other fun details I had cut from the white cardstock. This method cuts way down on your piecing together time of your more intricate dies. And isn't it the wonderful details of dies like this Gingerbread House that we love the most! Happily, there are still a few of the Limited Edition Gingerbread House dies available. If you haven't picked yours up, add it to your Valentine's shipment so you don't miss out because once it's gone - it's gone for good. I know it's Thursday not Wednesday - we'll just call this Watch for it Wednesday on Thursday ok? I remember in elementary school making these little pockets out of a square. I made all sizes and was fascinated that you could even drink out of one of these, but you had to drink fast or you'd get wet. 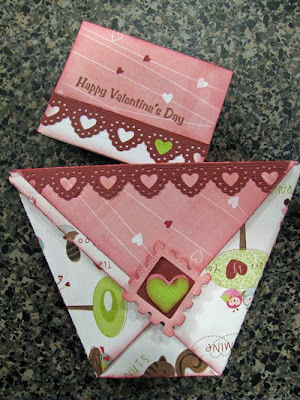 Anyway, I thought these would make cute Valentine pockets to hold a little note and a treat. They're really simple to make. I started out with a 5" square of double-sided patterned paper. I'm using BoBunny Bandit paper. This paper went great with the Camping release and now I'm using for the Valentine release too! 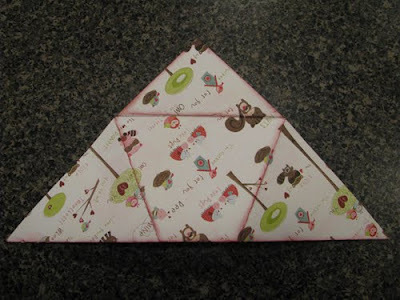 Fold it in half to make a triangle. Scoring it first helps it to fold better. Then take the left side corner and fold it up to the right side and crease. Then take the right side and fold to the left and crease. 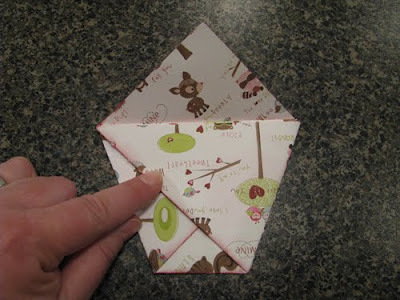 Take the top portion and fold one triange to the front and one to the back. I used some Distress ink to ink all my edges before I applied my adhesive. 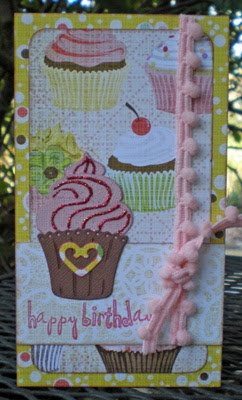 I added a border punch piece and used the cute little mini CottageCutz Love Postage Stamp die to embellish my pocket. I cut a piece of white cardstock that is 2 5/8" wide and 4" long and folded it half for my tag. There you go! 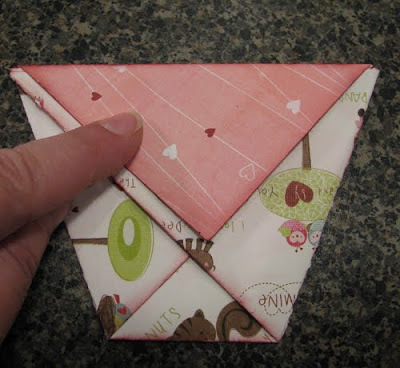 A quick and easy little pocket to hold a cute Valentine! 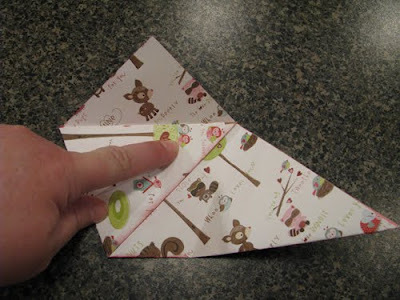 You can also take both triangle flaps at the top and fold them over to make an envelope flap. The CottageCutz mini's are just perfect to add a little touch of love - they are so cute! Karen Helmka of El Paso, Texas! I am a 38 year old, Mother, Wife, Surgical Tech by trade, SCRAPBOOKER, lover of photography, reading, gardening and a running junkie. I live with my husband of 16yrs and our 6yr old son in El Paso Texas. My husband is in the military, so we move every 3yrs or so. I really enjoy this life because I get to live in so many different places and meet so many fun people. I started scrapping in 2000 with Creative Memories. I didn’t get serious about it until the birth of my son in 2003. I have been on the 3Bugs in a Rug DT for the past few years and love it. I am lucky enough to have been published in Memory Makers, Scrapbook Trends, Creating Keepsakes and Scrapbook Ect. 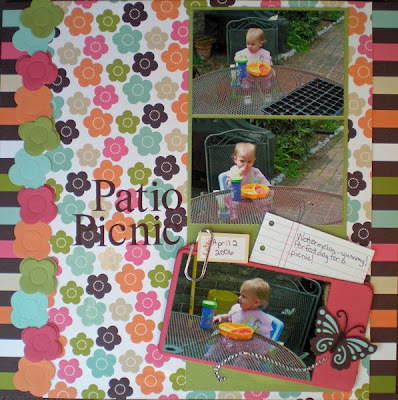 I love the creative outlet scrapbooking gives me along with preserving my family memories. I am honored to have been chosen to work with this incredible group of people! Thank you for this wonderful opportunity! Karen will be posting on Thursday's starting next week, so watch for her wonderful work as she showcases some of our cute CottageCutz dies. Watch for it Wednesday post will posted tomorrow instead of today, so we'll see ya back Thursday!